It was a Saturday night return visit to LoBianco’s in Collingswood. Carol and Joe B., Jerry and Sue C., and my wife, Kathy and myself had been there in mid-January and had a great meal. Tonight the six of us were joined by Hugo O. and his wife, Peggy. We don’t get to see them very often and Hugo always has some great stories to tell so LoBianco’s was the perfect setting for the evening. Having looked at the menu before we got there I was pretty sure I was going with either the chicken or the salmon so I chose the 2006 Hartley-Orstini, Hitching Post, “Highliner” Pinot Noir, from Santa Barbara. This was the wine that “Miles” (Paul Giamatti) ordered at the Hitching Post Restaurant where Mya (Virginia Madsen) worked as a waitress in the ultimate “wine movie”, “Sideways”. To their credit, they make no mention of the movie or their role in it on the back label as they detail this wine. I really enjoyed this wine, I thought the 14.5% alcohol content was well-masked by soft fragrances that gave this wine a delicate yet full texture that made it an excellent choise for my entree or for sipping on its own. Joe described his wine, the 2008 Fuedo Curezza, Sicily as “drinkable” and I commented that he might add the word “barely” to that description. His wife, Carol, ended the debate by proclaiming it “no thanks”. Hey, ya pays your money and ya takes your chances. Back on the food front, most of the table were engrossed in their appetizers, four of them enjoying the Roasted Portabello, layered sonoma valley chevre, port-scented carmelized vidalia onions and baby spinach topped with lemon beurre blanc. 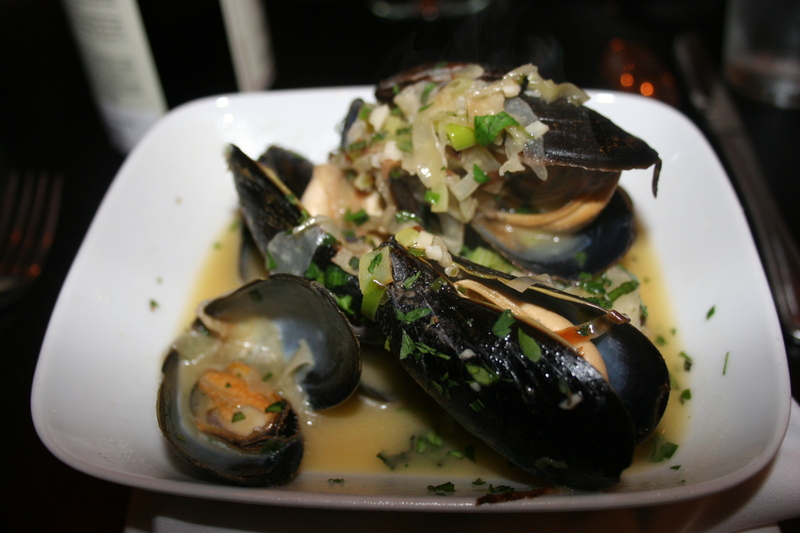 Joe and Kathy had the Prince Edward island Mussels, steamed mussels, braised fennel, garlic-saffron nage and chimay beer. The fact that both were desperately searching for additional bread to dip in the remaining juices led me to believe they were happy with their choice. I have never been a pate fan but others lately have shared some of theirs with me and I decided to try it on my own this time and ordered Chicken Liver Pate, warmed frisee with crisp pancetta scented with aged sherry vinegar, toasted raisin-walnut crute and brunoise of apple. Four nice offerings that went very well with the Pinot Noir. The picture was too dark to use here. 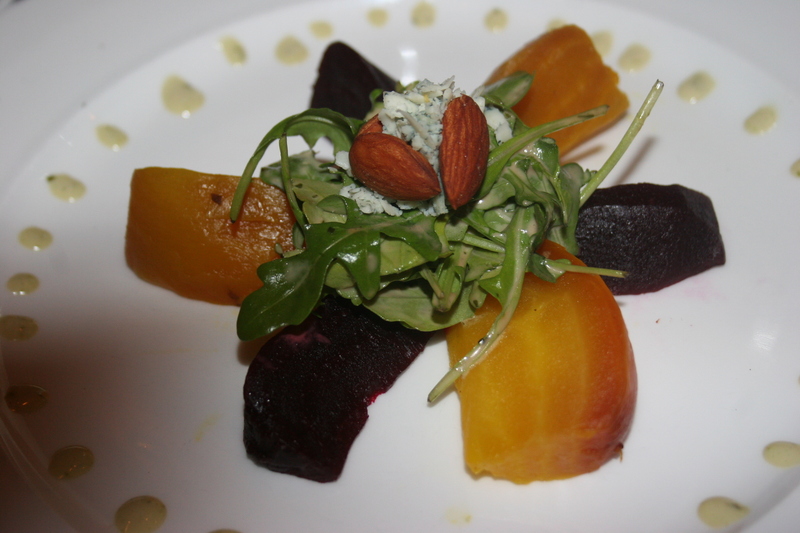 Sue chose the Roasted Beets and Blue, roasted red and golden beets with arugula dressed in a horseradish-sherry vinaigrette, topped with danish blue and toasted almonds. Everyone was happy with their choice and we had an opportunity to sample virtually every appetizer offered. 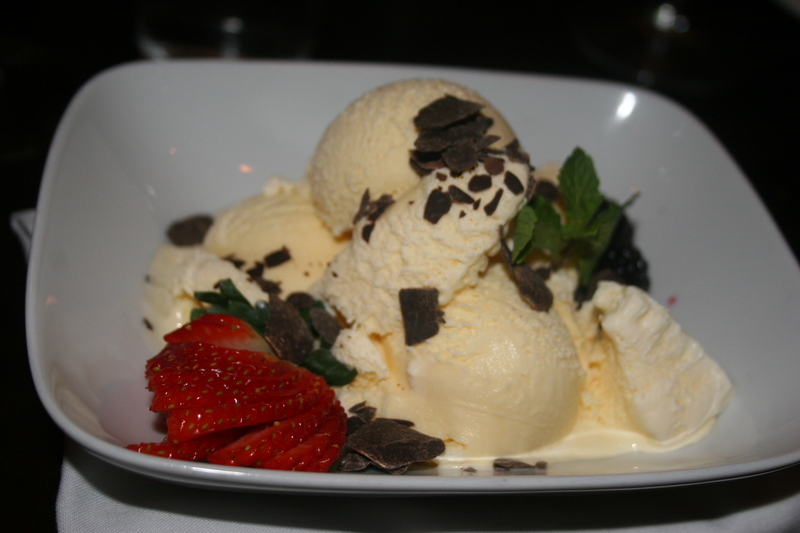 It should be mentioned again that LoBianco’s offers both a three and a four course tasting menu. 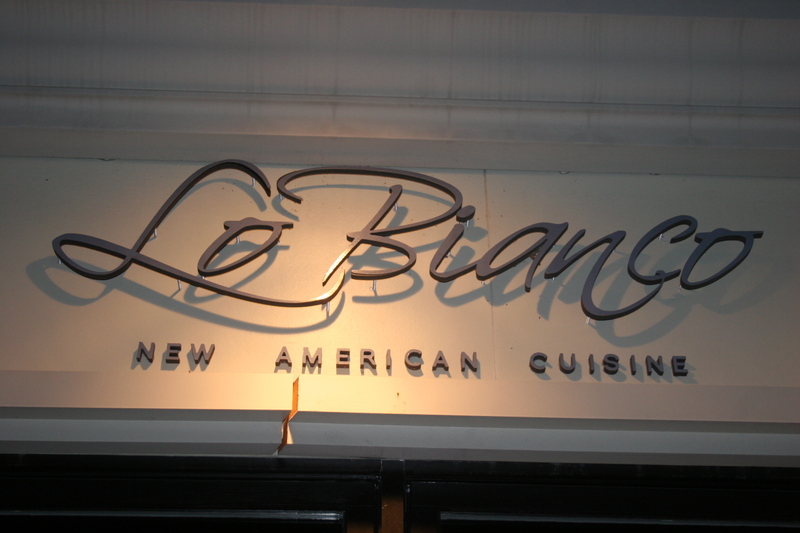 Three courses for $30.00 and four courses for $35.00. 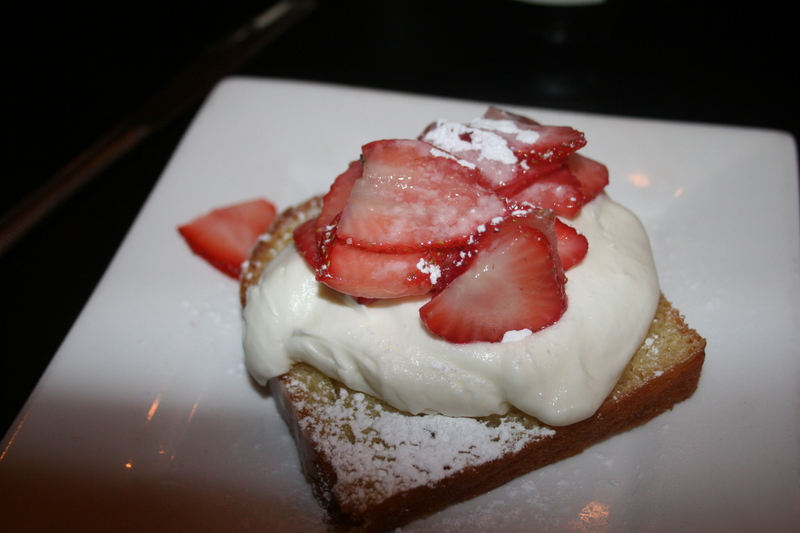 Each of us had picked the four course offering which meant we would have an appetizer, a salad, our entree and dessert. Having finished our appetizers, we each enjoyed a salad, most choosing the Grilled Romaine, warm salad consisting of hearts of romaine dressed with olive oil, crisp pancetta, chevre, cilantro-mint pesto and balsamic. Having completed the “adventuresome” portion of my dinner with the chicken liver pate I ordered the Market Salad which I had remembered as being very good last month. 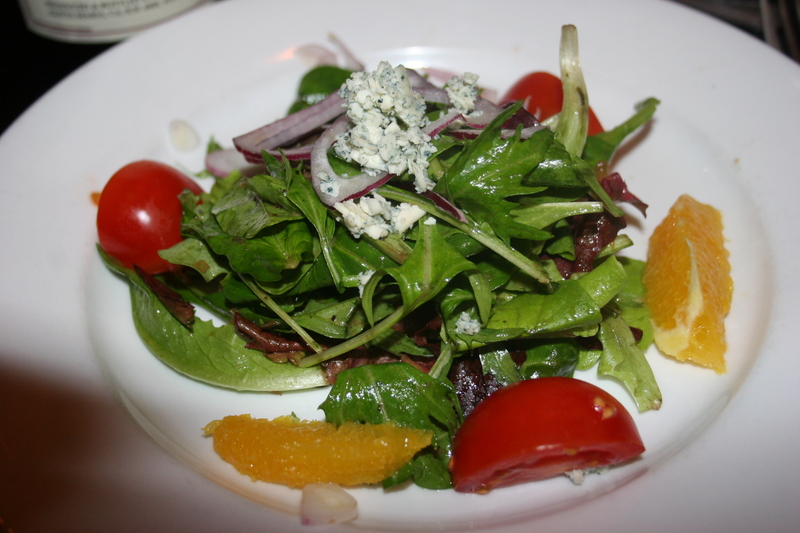 It did not disappoint as the combination of fresh field greens, vine ripened tomatoes, red onion, orange segments, roquefort blue and honey roasted shallot emulsion blend together to create a small culinary delight. There was a nice pace to the dinner and after a period of great conversation our entrees made their much anticipated appearance. Kathy and Peggy had the Norwegian Salmon, marinated seared salmon, farro salad with euro cucumber & hericot vert, balsamic infused vidalia onion confit. 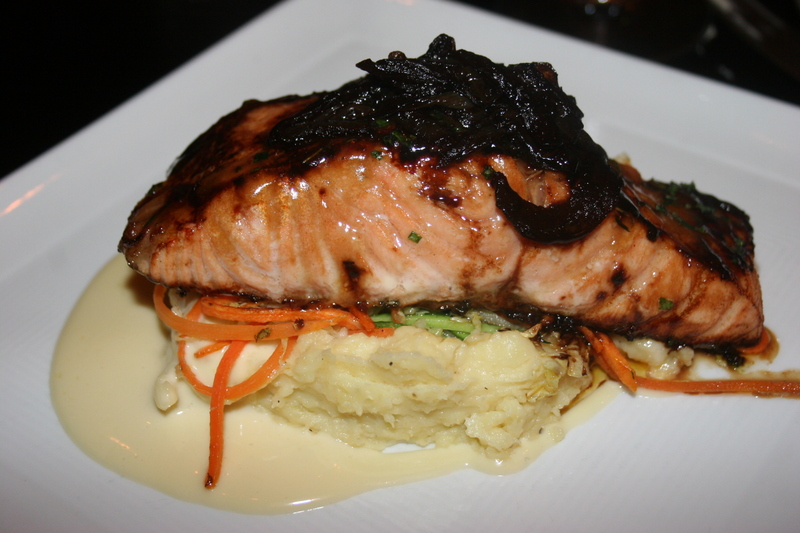 Kathy raved about her dish calling it “the best salmon I ever had out”. I have been trying to think of where she may have had better salmon “in” and I’m certain it wasn’t anything I ever cooked so that will remain a mystery. Anyway, she gave me a sample and it really was melt in your mouth good. 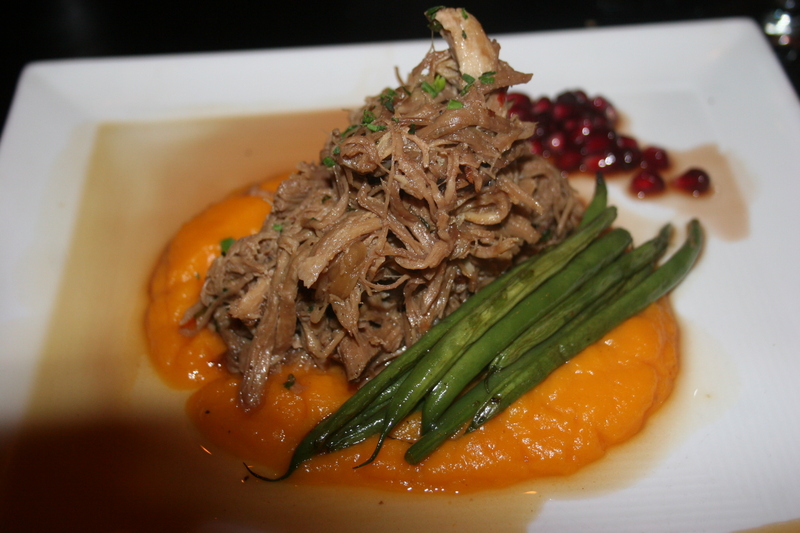 Carol had the Roasted Pork, eight hour roasted pork, sweet potato puree, pomegranate gastrique. hericot vert and port-scented pan jus. She liked her dish, didn’t love it but might have preferred something else since many of us were raving about our choices. 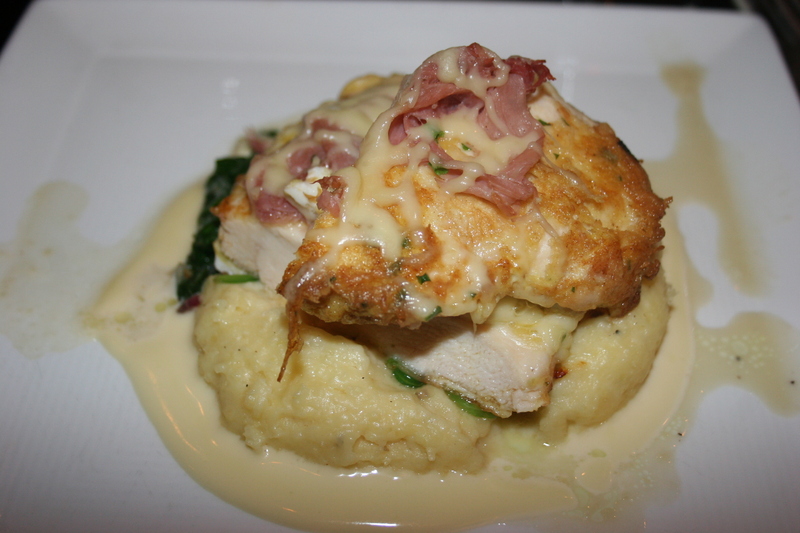 Last visit I had enjoyed the ribeye but this time I boldly requested the Chicken Indorati and I was not disappointed by the nice size portion of pecorino and fresh bread crumb encrusted chicken breast, topped with glazed fontina, served with truffled potatoes and baby spinach. I asked for and received a side order of the nutmeg scented creamed spinach which I remembered so well from the previous visit. I might add that I was not charged for this side dish. Therefore, I either thank them for their generosity or forgive them for their lapse of memory. I thoroughly enjoyed the meal. Joe mentioned that when a restaurant proves to be exceptional twice then you know you have found a good place. LoBianco passed this test. 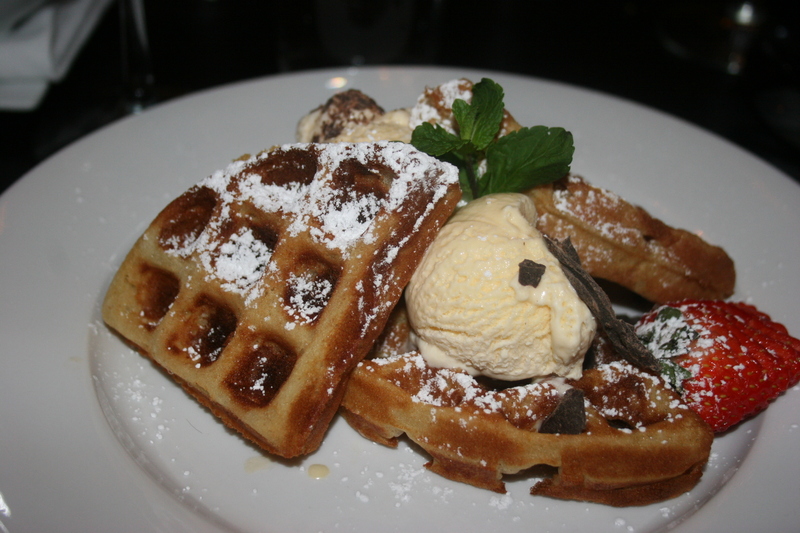 We each enjoyed out fourth and final course, dessert, with an equal distribution of such yummy items as home-made waffles and ice cream, lemon pound cake with creme fraiche and strawberries, french vanilla ice cream with chocolate chips and berries and Sue and Jerry with still another chocolate tort, boxed for home consumption. They are only two or three torts short of being able to open their own bakery. Collingswood, as I have mentioned many times, offers a multitude of very good BYOB’s. LoBianco doesn’t have to take a back seat to any of them. Ahhhh, if only there were ample parking in this food emporium along Haddon Avenue, we’d have culinary heaven.